By lowering the rear seatback(s) the luggage compartment space can be expanded. Do not drive the vehicle with occupants on folded down seatback(s) or in the luggage compartment. Putting occupants in the luggage compartment is dangerous because seat belts cannot be fastened which could lead to serious injury or death during sudden braking or a collision. Do not allow children to play inside the vehicle with the seatback(s) lowered. Allowing children to play in the vehicle with the seatback(s) folded down is dangerous. If a child enters the luggage compartment and the seatback(s) were raised back up, the child may become trapped in the luggage compartment which could lead to an accident. Tightly secure cargo in the luggage compartment when it is transported with the seatback(s) folded down. When transporting cargo, do not allow the cargo to exceed the height of the seatback(s). Transporting cargo stacked higher than the seatback(s) is dangerous as visibility to the rear and sides of the vehicle is reduced which could interfere with driving operations and lead to an accident. (Hatchback) When folding the seatback forward, always support the seatback with your hand. If it is not supported by a hand, fi ngers or the hand pressing the push knob could be injured. Check the position of a front seat before folding a rear seatback. Depending on the position of a front seat, it may not be possible to fold a rear seatback all the way down because it may hit the seatback of the front seat which could scratch or damage the front seat or its pocket. Remove the head restraint on the rear outboard seat if necessary. If your vehicle is equipped with the head restraint, lower it all the way down. Refer to Head Restraints on page 2-11 . Open the boot lid and pull the lever of the seatback you want to fold down. (One-piece folding type seat) Open the boot lid and pull the lever of the seatback. Open a rear door and fold the rear seat forward. Lower the head restraint all the way down. Press the push knob to fold down the seatback. Secure the rear seat belt in the belt clip. When returning a seatback to its upright position, make sure the 3-point seat belt is not caught in the seatback and the 3-point seat belt is not twisted. If the seat belt is used while it is twisted and caught in the seatback, the seat belt cannot function at its full capacity, which could cause serious injury or death. When returning a seatback to its upright position, make sure that it is fi rmly locked and the red indication is not visible (Hatchback). 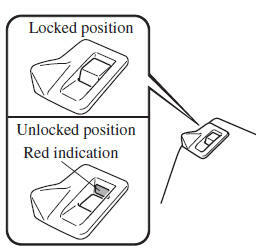 If the red indication is visible behind the push knob, it means the seatback is not locked. If the vehicle is driven without the seatback locked, it could fold down suddenly and cause an accident. 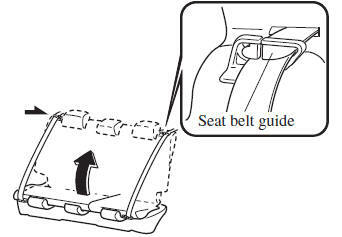 Make sure that the seat belt passes through the seat belt guide correctly and it is not twisted, then raise the seatback while preventing the seat belt from being caught in the seatback. Press the seatback rearward and lock it in place. After returning the seatback to its upright position, make sure it is securely locked. 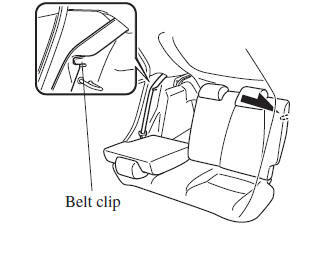 Verify that the seat belt is secured in the belt clip. 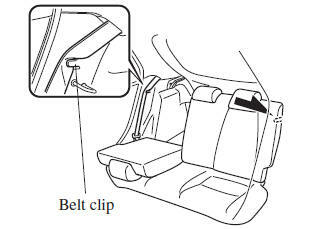 Make sure that the seat belt is neither stuck in the rear seat nor twisted, then remove the seat belt from the belt clip.